Sticky Fingers - The love child of a fling between Manchester Rock and Kingston Dub and raised on Rock and Roll, luring listeners with a salivating caress of the soul. 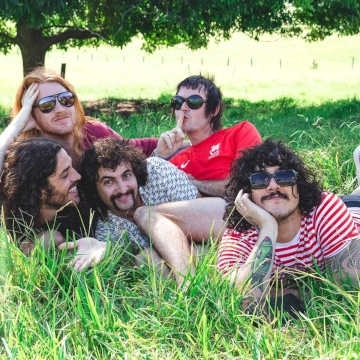 Australia’s Sticky Fingers will be unleashing their fourth LP, Yours To Keep, on February 08 (out through Sureshaker) with an album tour to follow. Their latest album Westway (The Glitter and the Slums) debuted #1 on the ARIA Album Charts, their sophomore album Land of Pleasure debuted at #1 on AIR Independent Charts, and they’ve racked up an arsenal of viral hits (“How To Fly” is sitting on 21 million YouTube views, “Australia Street” has 14 million). They wrapped up 2018 being the 4th most streamed Australian Artist on Spotify alongside Vance Joy and Sia. STI FI, soars from strength to strength on the back of a workhorse ethic. Such is the way legends are born.